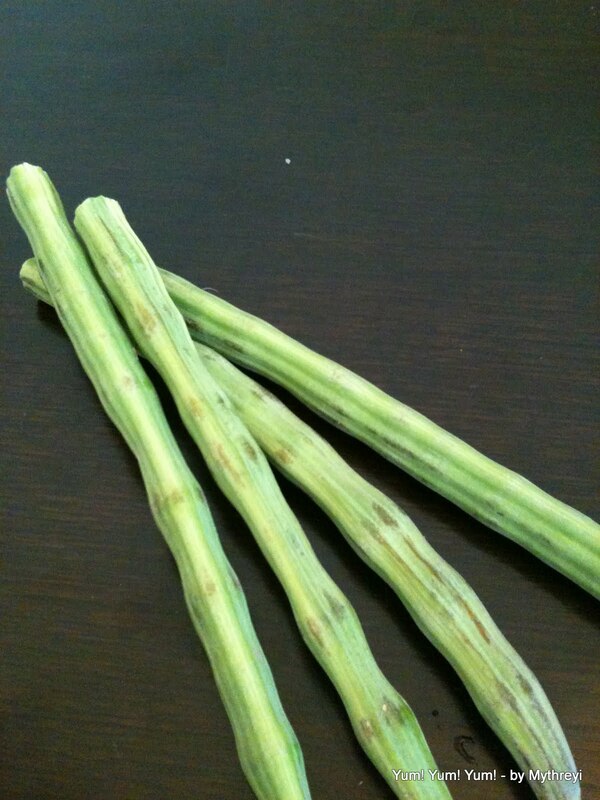 Drumstick is one pleasure vegetable that I have always missed in USA. We used to get these fresh in 'Taj Groceries' sometimes (in DFW) but not that tender and good ones, and that too very expensive. So I always used to rely on the Frozen ones, but only used them in sambar as i don't like their slimy texture and taste. But now being here in India, and fresh and tender drumsticks are available all around me, I couldn't resist myself from making this flavorful curry where the recipe comes right from my mom's kitchen. 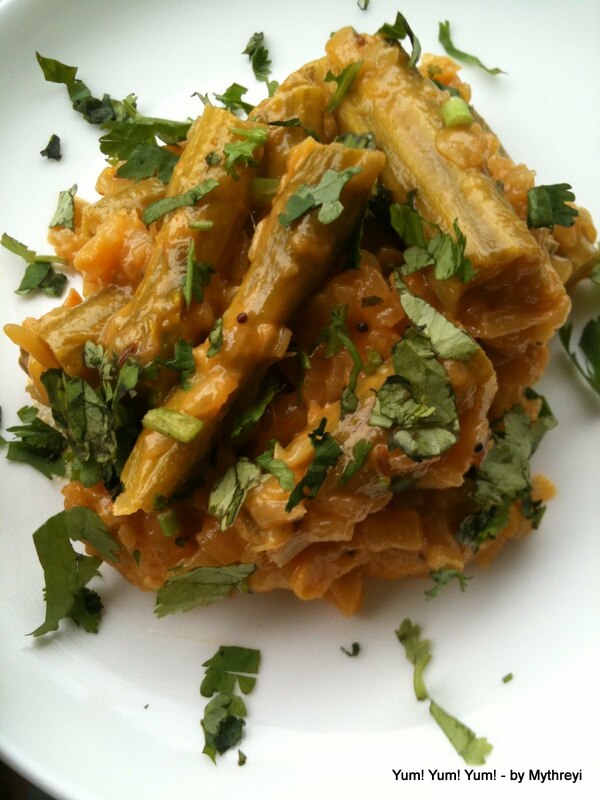 This is yet simple recipe, but the drumsticks make it much savory and flavorful, So Enjoy! Missing my digi SLR badly, still in suitcases, but thanks to my iPhone, always comes to rescue !!!! Take the Non Stick Pan ( or sauce pot) and heat the oil in it. Add the red chilies, followed by chana dal, cumin seeds and mustard seeds. Once the Mustard seeds splutters add the curry leaves. Once the tempering is done, add the green chilies and onions. then add the turmeric powder. Saute the onions until the raw smell goes away and then add the drumsticks cuts ( cut into 2 inch bites). Make sure the drumsticks becomes soft and curry comes thick and together and then add the milk. Let the milk mix into curry ( for 5 min) and close the lid and switch off the stove. After 10 min open the lid and serve into serving bowl and garnish with cilantro. Serve over hot white rice and with some chips and dig into this yumminess with no late. Drumsticks and Tomato Curry is another great combination. Drumsticks gives a new taste to Sambar always. And if there any other combinations with drumsticks please let me know, would love to try them all. 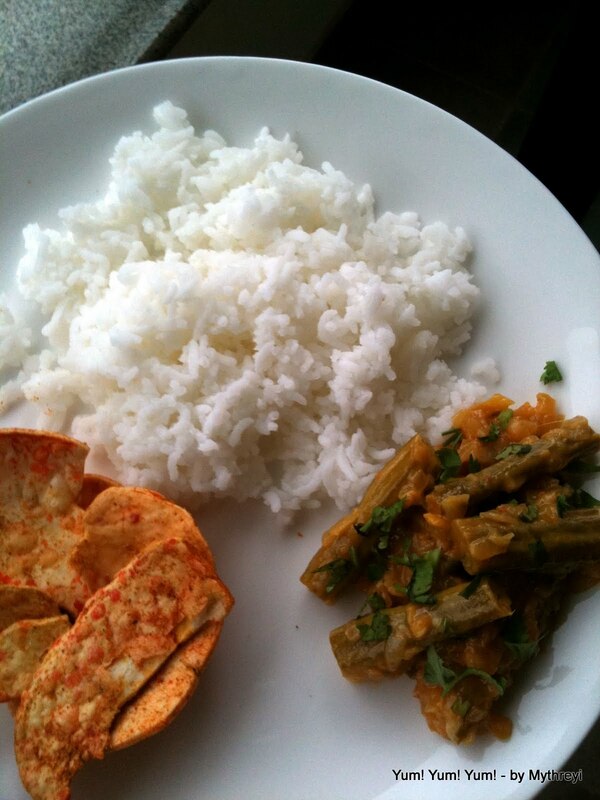 The tender drumstick leaves are very famous for their nutritional value and dal can be made with them. Love this addition to my drumsticks recipes. I make one often but to my horror I have never posted it. Will do so soon. this looks deliciousssssss ..any leftovers pls.?..Yummo.. Do visit my blog 2 :).. This sounds too good.. beautifully pictured..